Looking back at the Grand Theft Auto 3 series It’s pretty mind-blowing that games you formerly played via loading up a disc on your cutting-edge gaming console or PC just ten years ago can now be downloaded and played on your cell phone in a matter of minutes, Insane! Although one particular drawback of digital downloads is that you no longer get the experience of unwrapping the cellophane and packaging and diving in to explore those printed manuals, liner notes – and in the particular case of Rockstar games, those quite helpful printed map posters! 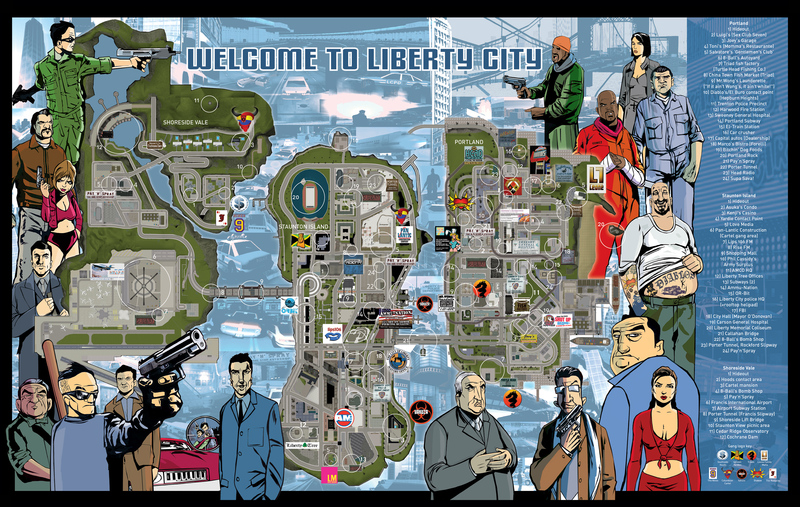 Grand Theft Auto 3 has been out on iOS and Android devices for over a year now, with Vice City having recently been released. 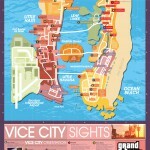 With that in mind Rockstar has released high quality .jpg files of the maps included in the box with Grand Theft Auto 3, Vice City and San Andreas. Perfect to print out if you wish, or just browse as you play the games on your iOS and Android phones / Tablets. As it also happens Grand Theft Auto 3 is currently on sale on both the Google Play and iTunes stores for £0.69p, a real bargain! The game is a quality conversion to modern day mobile devices. I personally think its well worth owning even if you played it back in the day, its sure to bring back some memories. I remember my PC at the time struggling to play Grand Theft Auto 3 in low detail, now 10 years later i have a mobile phone that fits in my pocket and will play the game with ease in maximum detail. I also remember playing Vice City on the internet using Multi Theft Auto, this was a mod that allowed people to free roam and battle it out in the Grand Theft Auto 3 / Vice City worlds! I might still have some old screenshots saved of that ill have to find out! 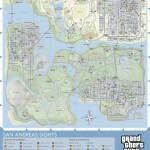 I have attached the maps to this blog post, download the high quality Grand Theft Auto maps below! 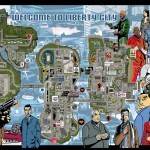 A high quality map of Grand Theft Auto 3 that can be printed off. 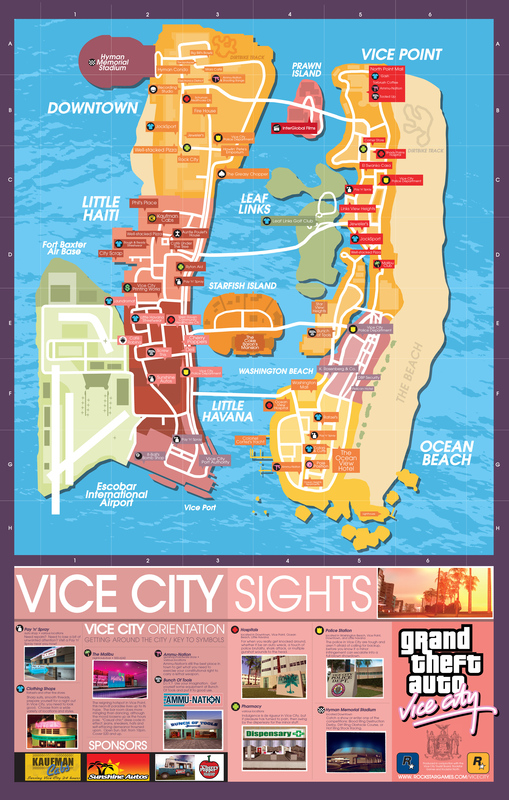 A high quality map of Grand Theft Auto Vice City that can be printed off. 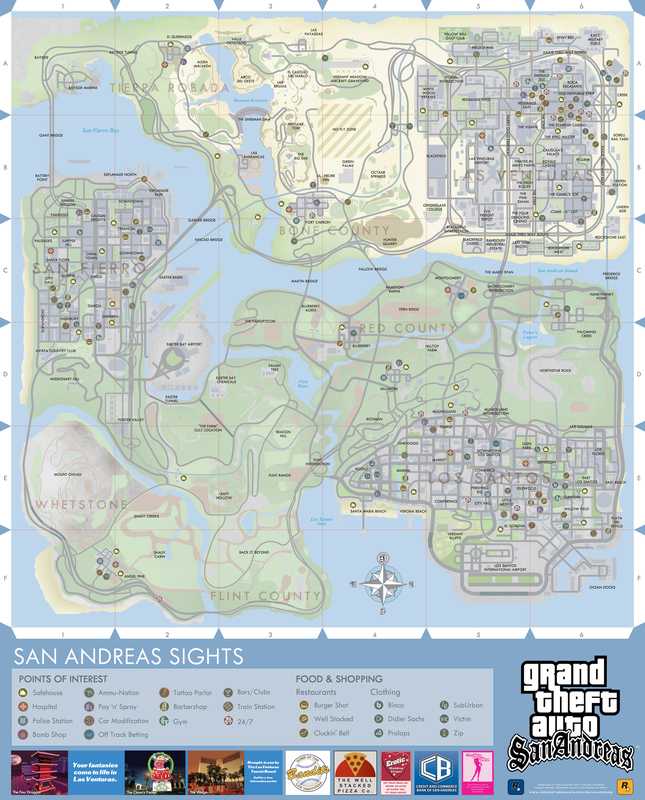 A high quality map of Grand Theft Auto San Andreas that can be printed off.